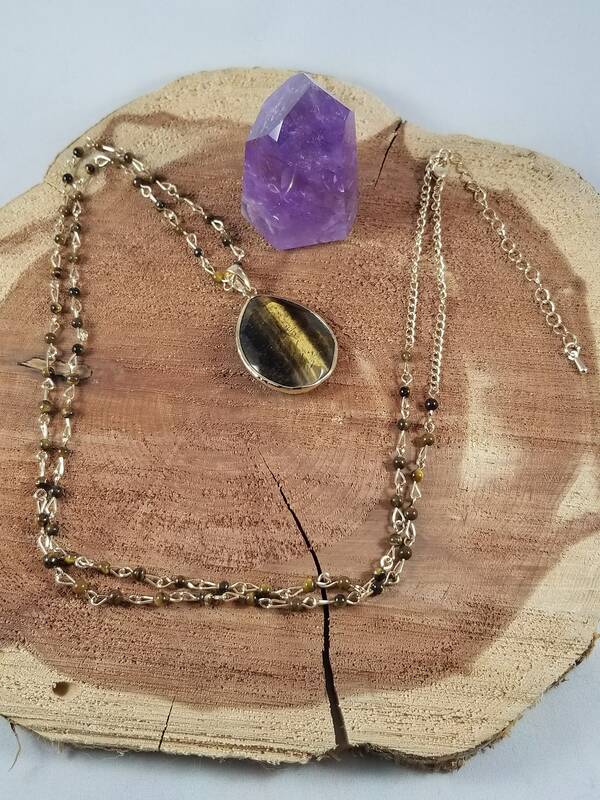 This is a 36 inch Gold Tone, Beaded Tiger's Eye necklace w/ a Tiger's Eye Pendant. 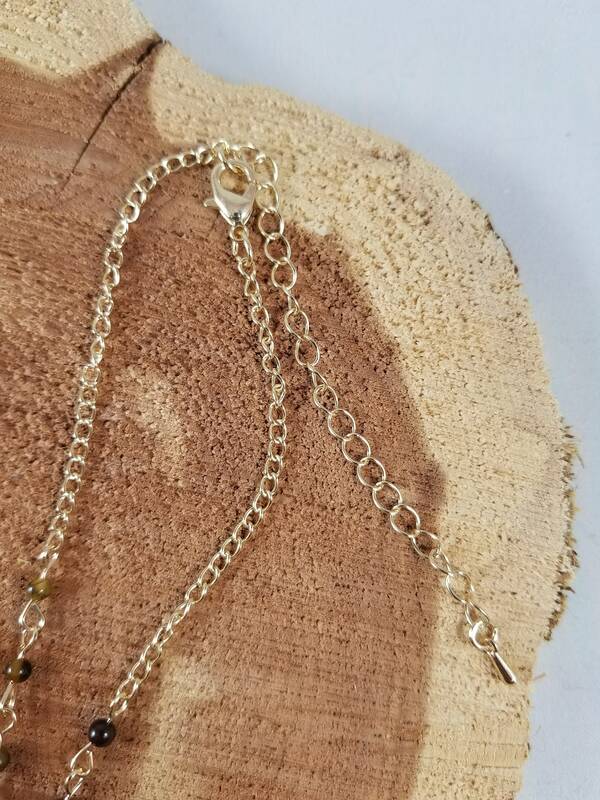 The Chain has a 6 inch extender, so you could layer this chain by wrapping it around your neck more than once; versatile and stylish. 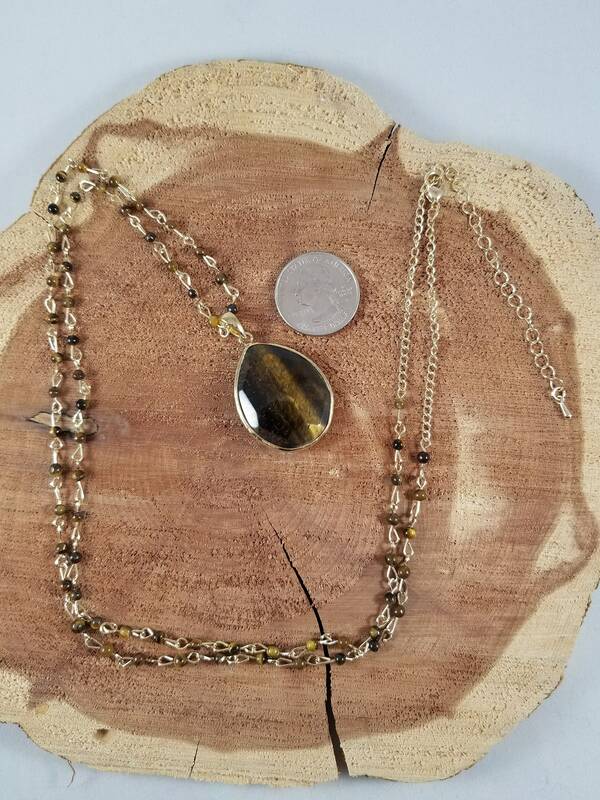 "Be a boss at everything you do when you channel the energy of Tiger’s Eye, the ultimate power crystal in the world of gemstones. For all the dreamers who have been put in a cage either by other people or their own self-doubt, the Tiger’s eye crystal is the zookeeper that's going to set you free. When it comes to negative emotions like fear and self-loathing, thoughts are not your friends. But the Tiger’s Eye crystal meaning helps keep it all in perspective. With an aesthetic as bold and intense as its healing properties, Tiger’s Eye crystal helps balance toxic emotions by keeping the mind razor-focused on your true desires. 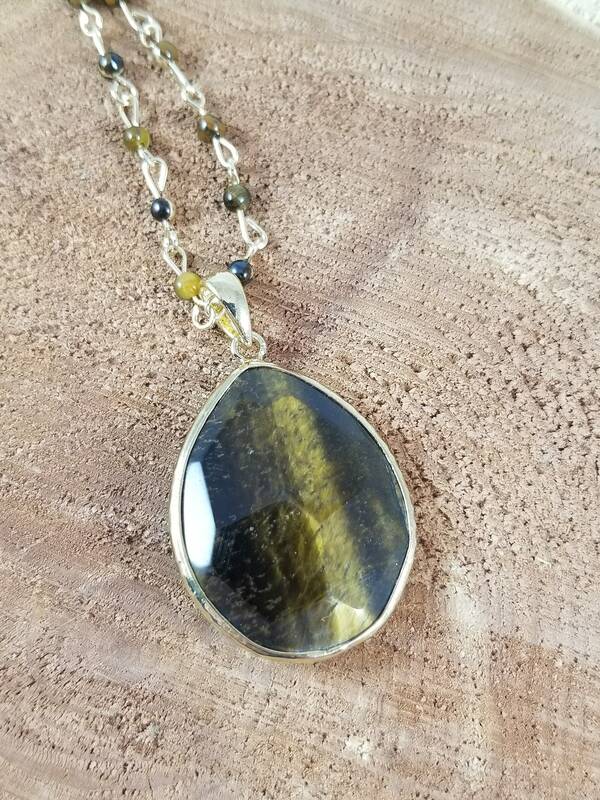 "Without fear or anxiety holding you back, unlock hidden talents with the Tiger’s Eye crystal stone, which is known for stoking the fires of passion deep within the loins. If you're feeling creatively stuck or spiritually adrift, Tiger’s Eye serves as your spiritual compass that guides you towards the light, helping you harness the powers of the universe in whatever you set out to do, whether it's matters of the heart or the boldest career ambitions. "Channel the powerful energy of Tiger’s Eye by gazing at its shimmery luster that resembles a cat's-eye when turned in the light. Also called ‘chatoyancy,’ the French word for 'cat,' Tiger’s Eye crystal properties help fuel the fire of your passions when you quietly meditate with the stone on a daily basis."